Since 1997, Yokogawa has adopted Enterprise Technology Solutions as its new business concept. ETS is a commitment to the aim of providing optimum solutions from the viewpoint of enterprise management, to satisfy every customer's requirements and expectations with the state-of-the-art technology, and the fields it covers range from control to enterprise information management. As a core product in the control domain of overall ETS solutions, we have developed the CENTUM CS 3000, a process control system for large-scale plants. To provide an open architecture, the operating system Windows NT, which has already become a de facto standard, is used as the human interface. Control functions of the CENTUM CS 3000 are configured by field-proven hardware and software to assure high reliability. This paper describes the features, functions, and architecture of the CENTUM CS 3000. The role of the process control system used to be simply controlling plant operations, but now, there is the need to meet the requirement to closely link this to the enterprise management information system and production management information system. There have also been drastic changes in the field of information technology (IT). Before we knew it, our office desks were occupied by personal computers. In this climate of enormous change, open-architecture systems using de facto standards have become an integral part of current times. In 1997, Yokogawa introduced the CENTUM CS 1000 distributed control system for medium- and small-scale plants. The CENTUM CS 1000 is an open-architecture DCS using Windows NT as the operating system of its human interface, which was already a de facto standard in the field of IT at that time. Figure 1 shows the components of CENTUM CS 3000. The greatest feature of the CENTUM CS 3000 is the use of Windows NT as the operating system of components for operation and monitoring, which thus achieves a truly open architecture by allowing the application of general-purpose personal computers for the human interface. 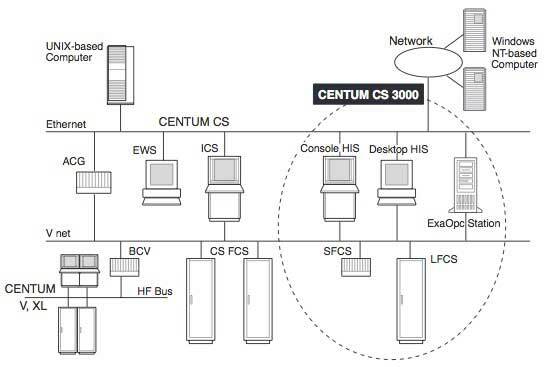 Figure 2 shows the system configuration of the CENTUM CS 3000. Twenty-four years have passed since the CENTUM was rolled out as the world's first DCS in 1975. Up until now there have been several model changes. The first CENTUM had built- in microprocessors which at the time had begun to gather public attention as a technology offering great promise, and established the basic architecture of the CENTUM series in which the human interface and controllers are separated from one another and connected on a control bus. The first CENTUM introduced a new scheme, process operation and monitoring via CRTs and keyboards, to the world of process control. Present DCSs have inherited the basic architecture established by the CENTUM. As microprocessors advanced from 16-bit design to 32-bit design, Yokogawa released the CENTUM V in 1983 and the CENTUM-XL in 1988. Although at that time it was acknowledged that customers were dissatisfied with the fact that DCSs were closed systems, Yokogawa was focusing on incorporating into the CENTUM original devices and developing original operating systems and other software in order to gain better performance, by improving real-time controllability of controllers, increasing application capacity, and reducing the display retrieval time for the human interface. 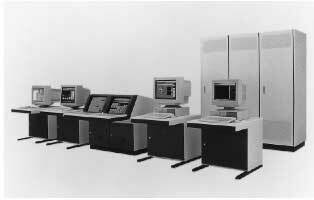 Each EOPS operator station, the human interface of the CENTUM-XL, was composed of up to 4 CRTs with 32-bit built-in processor, representing the best performance in those days. After the CENTUM V, the market moved towards unifying the operating system and other software, and UNIX was gathering public attention. In response to this trend, UNIX was employed as the operating system of the ENGS engineering workstation, which was used for system generation and modification in the CENTUM-XL. Furthermore, the debut of the CENTUM CS in 1993 overthrew the common sense of those days by employing UNIX as the operating system of ICS human interface stations in addition to the engineering workstation. This means that the operating system was unified through all stations except for control stations. In response to the dissatisfaction with the fact that DCSs were "closed" systems, the employment of UNIX enabled DCSs, made it possible to exchange data with external systems over a LAN and Ethernet. In recent years in the field of IT, Microsoft Windows has overtaken UNIX and greatly changed the world of computers. Popular IBM PC/AT-compatible machines were chosen as standard hardware specifications and Windows strove to present a more open architecture than UNIX could ever have done. The CENTUM CS 3000 was developed under such conditions of change in the field of IT. Equipped with the OLE for Process Control (OPC) Server function. Supports the FOUNDATION™ Fieldbus for integration with networks of field sensors and actuators. Allows programmable logic controllers (PLCs) to be connected easily. The open engineering data structure allows external tools to be used for generating, modifying, and managing engineering data. Allows Windows-based operations, which are familiar to most PC users. Allows vendor standard, low-priced PC hardware to be used as the human interfaces. Allows data to be exchanged with a diverse range of software available on the market, including business applications. Inheriting the simplicity of engineering from the CENTUM CS 1000, the CENTUM CS 3000 has additional engineering functions that are suitable for the control systems of large-scale plants. During the life cycle of a plant, a DCS may often be modified and expanded. In the CENTUM CS 3000, engineering of system modifications and expansions can be isolated from the operation of the existing system so that engineering can be implemented efficiently without effecting plant operation during the engineering period. In the CENTUM CS 3000, operator stations are generally referred to as human interface stations (HISs in short). The adoption of Windows NT as the operating system means that each HIS can run system generation functions and other general- purpose business applications such as Microsoft Excel as well as performing operation and monitoring functions. As shown in Table 1, two types of hardware platforms can be used for HIS, thus allowing the machine which is most suitable for each user to be chosen. The user can choose the PC model with the highest cost-performance at the time when the user purchases a CENTUM CS 3000 system. Higher CPU performance shortens the time taken by the operation and monitoring functions to retrieve windows in response to user requests. Console type, industrial PC supplied by Yokogawa has touch operations with a similar feel to those of the user interface of earlier CENTUMs. Control stations in the CENTUM CS 3000 are generally referred to as field control stations (FCSs). FCSs are the core of each system and are necessary to control a plant continuously for 24 hours a day, 365 days a year. Although in order to obtain an open interface, Windows NT is used as the operating system of system components for operation and monitoring, a Yokogawa original operating system is still used for FCSs in the CENTUM CS 3000. This is because FCSs must demonstrate high reliability for continuous 24-hour based operation. There are two types of FCSs for the CENTUM CS 3000, as shown in Table 2. Each uses the hardware and programs that have been field-proven in the CENTUM CS and CENTUM CS 1000, ensuring high reliability. The control bus is as important for control as FCSs. Vnet (10 Mbps, token passing method), the control bus that has already been field-proven with the CENTUM CS, is also employed as the control bus for the CENTUM CS 3000. Vnet is a dual-redundant bus standard. In the CENTUM CS, the information network was Yokogawa's original Enet. While, in the CENTUM CS 3000, the more commonly used Ethernet is employed as its information network with the aim of developing the open system, thus allowing CENTUM CS 3000 systems to be connected to the user's intranet. ACG: Provides an Ethernet port for supervisory computers and supports the TCP/IP protocol; also used for connecting the Vnet to a large area network. BCV-V, BCV-H, BCV-L: Gateway units used to connect Vnet, HF-bus, and HL-bus to the Vnet of the CENTM CS 3000, respectively. The BCV-Vs are used to connect CENTUM CS 3000's domains with one another when configuring a large-scale system. The BCV-H and BCV-L are used to connect existing CENTUM-XL and (XL systems to the CENTUM CS 3000. Recently, activities to standardize the network of field sensors and actuators have increased. Representative field networks that have been standardized in the sector of process automation include FOUNDATION™ Fieldbus (mainly promoted in the US and Japan) and PROFIBUS (mainly in Europe). The CENTUM CS 3000 supports these two field networks. Operation and Monitoring Functions The leading-edge human interface functions developed for the CENTUM CS 1000 system for medium- and small-scale plants have been inherited, and functions required for a large- scale system (as in the CENTUM CS) have been added to the CENTUM CS 3000. The CENTUM CS 3000 does not merely use Windows NT but makes full use of the operability of the Windows operating system which has with the spread of Windows PCs become common knowledge. The CENTUM CS 3000's operation and monitoring functions allow the user to choose the display mode from two. The window mode allows windows of other Windows applications to be displayed on the same screen at the same time as operation and monitoring windows. The full-screen mode displays operation and monitoring windows in the full screen so as to allow operators who are accustomed to the display panels of the CENTUM CS or earlier systems, to experience a sense of familiarity. We have already described the fact that it utilizes the same hardware and control program as earlier CENTUMs. In the CENTUM CS 3000, however, the database structures are changed to a fixed-word-length database to speed up on-line maintenance. The reading functions, basic functions and extensive subsystem communication functions of the CENTUM CS's FCS are inherited. In addition to these, the CENTUM CS 3000's FCS supports communication with FOUNDATION™ Fieldbus. An Ethernet card was developed for the PFCS, a compact FCS, to allow data (digital, analog data and messages) in PLCs to be exchanged via Ethernet and to be handled as tag data in the CENTUM CS 3000. The CENTUM CS 3000's system generation functions provide the most powerful engineering environment in the history of the CENTUM series. Virtual Test: Yokogawa's original function to test the functions of field control stations allows the carrying out of engineering ranging from system generation to debugging to be accomplished on a PC. Divided Engineering: Facilitates engineering for expansion and modification of the existing system. Independently generated projects can be integrated into one large-scale system. Quick Online Maintenance: The realization of speedy online maintenance through the use of a fixed-word-length database. File Import/Export: Engineering data can be imported and exported from/to files of popular Windows NT-based applications such as Microsoft Excel. Graphic Debugging Function: Functional check of graphic windows can be performed without an FCS and HIS. Decreased Setting Items in Builders: Specifications that normally do not need to be set are hidden as advanced settings and set at the default values. In the era of UNIX, it was reported that Ethernet and the TCP/ IP protocol standardized supervisory communication. Nevertheless, because the interface for the application layer had not been standardized the specifications of communication between a computer and a DCS varied between vendors. The OPC employed by the CENTUM CS 3000 is becoming a de facto standard in the process automation industry. The OPC server in a CENTUM CS 3000 system supplies almost all data inside the system to supervisory computers. Yokogawa is adapting MES*2 software applications to the OPC technology. ActiveX is a technology that enables software components to interact with one another in a networked environment, regardless of the language in which the components were created. ActiveX controls are reusable software components that incorporate ActiveX technology and can be used in different machines, because they are machine-independent objects. Hence, a window configured by ActiveX controls can work on a UNIX-based supervisory computer as well as on a Windows NT-based HIS. In other words, such a window can be shared between an HIS and other computers. An HIS of the CENTUM CS 3000 allows ActiveX controls to be embedded in a graphic window to add specialized functionality that could only be achieved by the so-called computer windows in earlier CENTUM systems. The "seamless enhancement" feature of FOUNDATION™ Fieldbus was adopted, enabling the seamless connections of control functions, unification of operation and monitoring functions, integration of engineering functions as well as the enhancement of functions to improve operability and functionality. Even when Fieldbus devices are mixed with conventional analog input/output signals, the system can be built without paying special attention to fieldbuses. The device management function reduces the man-hours required for maintenance, thus resulting in the reduction of the total cost of ownership (TCO). By installing a newly developed Ethernet card and running a user C application inside a compact FCS (PFCS), data can be acquired from the PLCs of various vendors. Batch control had not until recently been standardized because batch processes are applied to diverse industrial sectors, and the product types handled and processes themselves are complex. In the struggle to standardize batch control the Instrument Society of America (ISA) formed ISA/SP88, and issued S88.01, the specifications for batch models and terminology, in 1995. These specifications were adopted as an IEC standard in 1997. We have developed CS Batch 3000 as a batch control software package for the CENTUM CS 3000 that is compliant to IEC/ISA standards. For use with CS Batch 3000, we also prepared batch templates incorporating our sound expertise of batch applications, thus allowing efficient startup and cost reductions of a batch control-oriented system. As with the CENTUM CS 1000, documentation is supplied in the form of electronic document files. It will be possible to use the existing input/output units of FCSs and replace the controllers with FCSs of the CENTUM CS 3000 before the total lifecycle costs drastically increase. While running the existing control applications, communication with upper-level information systems will be enabled and the user will be able to use the new operation and monitoring functions of the CENTUM CS 3000. Safety systems, which have become essential to every plant in Europe, will be able to be seamlessly connected to the CENTUM CS 3000. Exaquantum is a software package that fills the gap between a control system and MES. The OPC technology is used for process data access. Exaquantum will enable more exhaustive integration of the CENTUM CS 3000 with upper- level information systems. The primary concern of Yokogawa has been to successively improve the DCSs of the CENTUM series, by making them more consistent, enhancing system reliability, long-term availability, and safety integrity. We are proud of this history and our ability to offer extensive engineering expertise and customer services. We surely believes that open technologies, such as the OPC and field network, will strengthen in the field of process control systems in the not-so-distant future. As networks become more open, multi-vendor systems will increase. 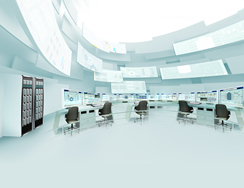 Regardless of the extent of change occurring in the field of process control systems, Yokogawa as a hardware and software vendor and system integrator shall continuously help configure the optimum control system for each user, based on the accumulation of reliable control technology and extensive experience in the field. *2 An acronym of Manufacturing Execution System; in the system hierarchy, an MES is positioned beneath the Enterprise Resource Planning (ERP*3), the top information system in an enterprise, and above production control systems including DCSs. An MES is a suite of software applications that cover operation management and production management of manufacturing plants. For example, those applications perform statistical computations and analyses of data from production control systems and convert a production plan given from the ERP into production, facility, and equipment operation management plans. *3 An acronym of Enterprise Resource Planning; an ERP is the generic name for a suite of software applications that implement enterprise framework operation. For a manufacturing company, the ERP handles data of financial accounting, procurement, production planing, sales, and inventory and supports strategic management of the company.